Homes can be busy for lots of reasons. You might have kids running around all day. Or enjoy entertaining regularly. Or have a dog or a cat - or both! Whatever the reason for your busy, active home - there's a floor that can stand up to the challenge. That floor is a hard surface floor. Hard surface flooring is where it's at! 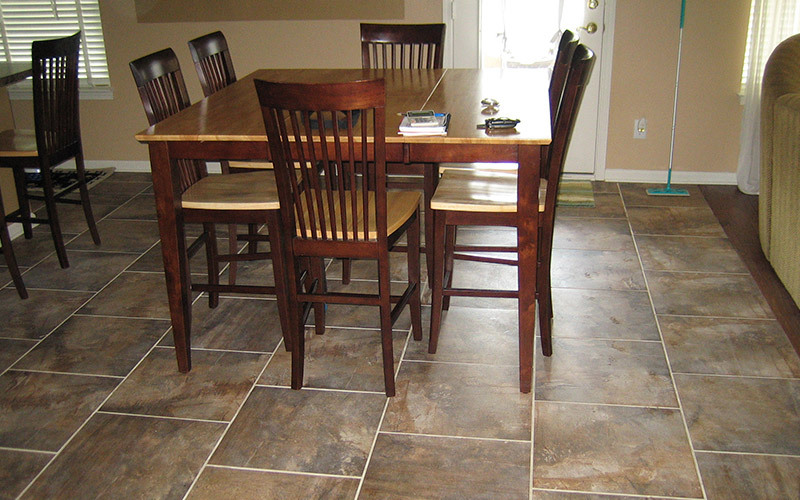 When you hear hard surface flooring your mind most likely turns to wood flooring or ceramic tile. Both are traditional workhorses when it comes to flooring and both are great choices. However, in today's flooring world you have far more to choose from. Resilient flooring, as the name implies, is able to handle a lot of traffic and bounce back beautifully. With a full range of designs - including some that beautifully mimic natural hardwood and stone - and a price that's budget friendly it's no wonder that it's becoming one of the most popular floors in our showroom. From luxury vinyl tile to waterproof composite flooring, there's an option of resilient flooring that's just right for your home. Learn why you should consider resilient flooring. One of the most attractive features of tile is its easy maintenance. This is a floor that can stand up to traffic, moisture and spills with ease. But tile has much more to offer than quick cleaning - tile comes in a wide variety of colors and textures that add something special to any room. The material of the tile itself also lends a strong design element, from the traditional look of ceramic to the contemporary feel of stone to the colorful mosaics of glass tiles. Learn why tile is such a functional, flexible floor. When you think of wood flooring in Indianapolis, hardwood is likely the first thing that comes to mind. Today’s wood flooring goes far beyond hardwood however. Laminate wood flooring and engineered wood flooring offer alternatives with the look of hardwood but more versatility at a lower price point. And all of these wood floor options come in a wide variety of shades, grains and styles. If you're looking for wood flooring, you might have more to investigate than you realized! Learn the different features of hardwood flooring. Another reason hard surface flooring is an excellent choice? Today's flooring manufacturers make crossover looks available. If you love the look of wood but want the practicality of tile, look at porcelain tile options. Maybe you would love a marble floor in your bathroom but know that it's too slippery to be practical, look at resilient vinyl tile or waterproof resilient floors with a natural stone look instead. When it comes to hard surface flooring, the look you want is available in the flooring you need. Learn more of the benefits of hard surface flooring in our free Hard Surface Flooring Guide.